According to my last tomato picture on instagram, it's been 18 weeks since I picked tomatoes from my own garden. That's really not that long ago. And tomatoes are always the first to croak, so I know I picked other things after that, because we had pretty warm weather in November. But I'm ready for spring to come again so I plant all of my seeds that just arrived! I start all of my seeds myself, in the greenhouse. I try to get organic or heirloom seeds as much as possible. This means I have to order from catalogs because my local stores have limited options in the organic arena. My flower seeds are not organic, and for that I feel bad. BUT, I don't eat them (the squirrels won't let me get the sunflower seeds), and I can get them so much cheaper at a discount store here. I worry that the seeds are not organic but everything I do is, so it must all balance out! I grow zinnias because they are very easy for me to grow and they look great. They also last right up to a hard frost, so in the fall, I can pick them and bring them in bouquets to school and they look great! I'm trying a variety of sunflowers this year that Burpee has so nicely bundled into one seed packet. The top flowers are Forget me Nots that my sister got in Alaska for me. I don't think I know what they look like, so I'm looking forward to seeing what happens. These are all varieties that I grew last year and which did really well for me. The Shiraz tall top beets have been the best I've grown out of all the types I've tried. The tops are nice and tall and the beets themselves are a good size and nice and dark, which I like. I picked all of the peppers before they turned red because I prefer them green, but couldn't find a green pepper I wanted. out of 10 seeds, 6 of them grew into really good plants. THat rainbow radish pack was so much fun last year. I went out one day and just about all of them were ready and it was like colored marbles in the containers! Tomatoes are an issue because I specialize in some horrid disease that ruins every plant I try. The two types of tomatoes here seem to resist it, so I'm trying it again! And the Waltham butternut squash grew really well for me 2 years ago, but last year none of my squash did much. I hope that was a one year anomaly! These are all new varieties for me. I've grown all of these vegetables, just not these specific types, so I'm looking forward to seeing what they will do. There's a new type of tomato in there too. Fingers crossed they will be fine. These are mustard greens, a new type of squash for me and Chinese cabbage. Sometimes I get excited to try new plants! I also have seeds from last year that I will use because usually, they do fine for a couple of years. 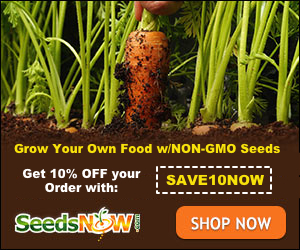 If you click this link to Seeds Now, (affiliate link) you can use this promo code to save $3 on your order. Or, click below and save 10% off your whole order. Do the math and see what's better! March 1st is just around the corner and I'm going to try my fate and plant some peas in the greenhouse. I'll start them on heat mats until the 20 degree nights go away. I learned this fall that they are NOT frost tolerant, so I need to watch out for the first month because March is a tricky month. But I'm just so ready to grow things again! !